In the morning you take the flight from Denpasar to Labuan Bajo (West Flores). Upon arrival, you will meet our guide and having lunch at a local restaurant. After lunch, our AC-car takes you directly to Dintor village ( 6 hours driving). 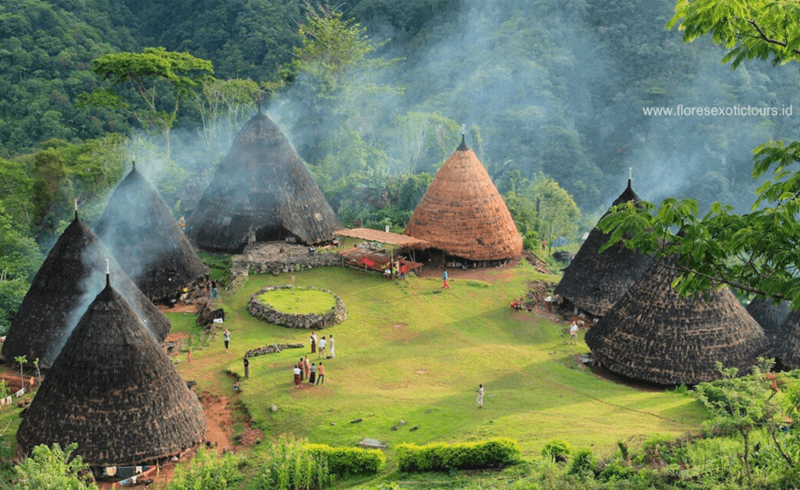 Dinner and overnight at Wae Rebo Lodge in Dintor or Homestay in Denge. After breakfast drive to Waelomba, Start Trekking from here passed the tropical rain forest, it takes for about 3 hours to Wae Rebo village, with the most authentic housing of Manggaraian culture, this village located about 1100m above sea level, in the middle of the mountain area. You will reach the village at noon and have lunch there. In the afternoon you have the chance to get in touch with the indigenous people and experience their culture and lifestyle. Or you can enjoy and discover the great natural surrounding by going for another walk surrounding the village. Dinner and overnight will be at the local villager’s visitor house. Sleeping mattresses will be provided. After the breakfast in Wae Rebo, you hike down to Waelomba again. Lunch then will be provided in Denge, Thereafter you continue the trip to Labuan Bajo. (Some stops can be done during the trip). Dinner and overnight at Puri Sari Hotel. The morning after breakfast, transfer to the pier of Labuan Bajo, get on board and cruise to Rinca island. Treks on Rinca island start from the ticket office at Loh Buaya to Waewaso, it takes 2 hours, the best opportunity to see dragons and their prey, passes the dragon nests and out into the sunshine across an exposed Savannah that is studded with lontar palms. and a permanent waterhole in Waewaso, across steep, exposed slopes that offer breathtaking views. afterwards, sail to Kambing island for snorkeling and afternoon proceed to Komodo island. Lunch will be pr0vided on board. Dinner and overnight on boat. Today you will visit Kampung Komodo (Komodo Village), walking around and keep in contact with the villagers, then continue to Loh Liang where you take medium trek takes about 1 1/2 hours. It passes a waterhole where the Timor deer and wild pigs often come to drink. Sometimes, dragons can be found there lying around and waiting. You will climb Sulphurea Hill and Frigate Hill, where a magnificent view across the islands, bays, and beaches awaits. Return to the boat and proceed to a pink beach. This peculiar beach gets its color from red coral fragments. It is definitely a great place to spend some time by just laying back or enjoying the underwater world with your snorkeling equipment. Lunch on board and afternoon back to Labuan Bajo. Overnight at Puri Sari Beach Hotel. – Personal expenses and Tipping.